The Ryukyu Golden Kings, Okinawa’s expansion team making its debut this season in the Basketball Japan League, will give the community its first look during the upcoming Oktoberfest Exhibition Games at Camp Foster. The Oktoberfest Exhibition Games take place October 13th at 6 p.m., and Sunday, October 4th at 3 p.m., at the Camp Foster Fieldhouse. The event is free, but Marine Corps Community Services says all spectators must have a ticket to gain admission. There is a limit of four tickets per person. Tickets are available on a first-come, first-served basis at all MCCS athletic facilities. The Ryukyu Golden Kings will square off against the Tokyo Apache. The Kings begin their first season next month in the two-year-old Basketball Japan League, one of two expansion teams this year. The league’s ten teams will play 220 games in front of anticipated crowds exceeding 700,000. 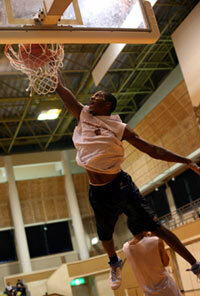 American Hernando Plannells, Jr., was selected as the Ryukyu Golden Kings head coach in May. Bryan Simpson, a former US. Air Force serviceman, is on the inaugural team, along with Okinawa native Naoto Takushi. The Ryukyu Golden Kings have been practicing throughout the summer. Ryukyu Golden Kings season ticket information is available online, at www.okinawa-basketball.jp/english.